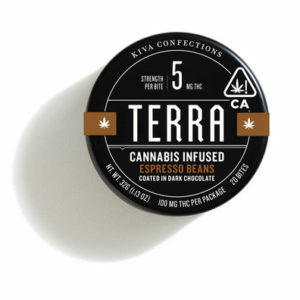 Kiva’s popular Terra Bites offer a discreet and portable way to low dose with a little extra kick at 5mg for that night out on the town. Kiva offers two flavors: milk chocolate covered blueberries and dark chocolate covered expresso beans. My favorite are the expresso beans because unlike a lot of cannabis edibles, the chocolate isn’t a mere afterthought. These produce more of a “high” so please use cautiously. If you’re concerned about the “high” during the day or evening – try one at night before bed to get started, and see how rested you feel in the morning.